Monterey Car Week Aug. 15-21 Various locations around the Monterey Peninsula The Monterey Peninsula is going through a love-hate relationship with Car Week these days. On the one hand, the various events bring in thousands of dollars for local charities, pro- vides employment opportunities for locals, and showcases automobiles you pretty much can't see anywhere else. But in growing from one or two events to dozens of events, from auto ral- lies, poker runs, parades, processions, and street displays to auctions, races, swanky lawn parties and gala nighttime events, not to mention the grand event that started it all, Sunday's Concours d'Elegance at the Lodge at Pebble Beach, Car Week has outgrown its home with all the events and the resulting traffic hassles. But that's the way it is. It's not changing anytime soon, so may as well embrace it. Or escape it. www.seemonterey.com/events/sporting/concours Sand City West End Celebration Aug. 26-28, Sand City I t's the little community arts festival that could. Sand City's West End Celebration has become one of the signature annual events on the Monterey Peninsula, one that draws thousands each day to peruse artwork and crafts from more than 100 artists and craftsmen, dozens of beer, wine and food vendors and continuous musical entertainment on three stages. Music highlights include performances by bluesman Coco Montoya, The Medflys, Fire in the Hamptons, Calico the Band, Painted Horses, Sky Country, and many more. 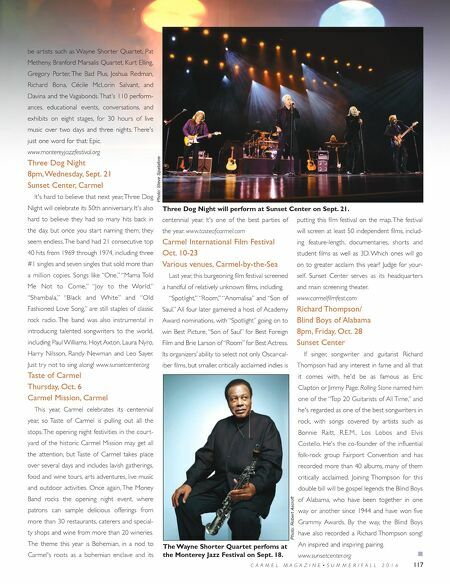 The three-day cele- bration opens Friday night with a concert by singer Maria Muldaur, Red Beans & Rice and Linda Arceo. www.west- endcelebration.com Art Garfunkel: In Close-Up 8pm, Thursday, Sept. 15 Golden State Theatre, Monterey Singer Art Garfunkel gets overshadowed by Paul Simon, but it could be argued that if they hadn't collaborated and hadn't become one of the most iconic duos in music histor y, that Simon's career trajectory may have taken a dif- ferent path. Garfunkel's pure tenor and sublime harmonies made the duo's songs distinctive and one of a kind. Garfunkel's solo career wasn't as prolific as Simon's, but he did have several chart- ing singles and albums, including a top 10 hit and three Top 2 hits. The duo was inducted in the Rock and Roll Hall of Fame in 1990 and received a Grammy Lifetime Achievement Award in 2003. Garfunkel's concert kicks off a week of con- certs at the theater that includes Latin/country rockers The Mavericks (Sept. 18) and folk stal- warts Iris DeMent and Loudon Wainwright III (Sept. 22). www.goldenstatetheatre.com Monterey Jazz Festival Sept. 16-18 Monterey County Fair & Event Center After 59 years, what more can be said about the Monterey Jazz Festival? It's not only the longest continually running jazz festival in the world, in which almost every jazz star of the last 70 years or more has performed, it has gone beyond iconic status to become historic. This year, one year before the monumental 60th annual event, the festival is bringing back some familiar names. Returning to the fairgrounds will EVERYONE LOVES A LIST, RIGHT? HERE ARE MY PICKS FOR FUN EVENTS WORTH CHECKING OUT IN MONTEREY COUNTY! ADMIT ONE W I T H M A C M C D O N A L D Pebble Beach Concours d'Elegance, an annual gathering of rare and antique automobiles, is held on Aug. 21. 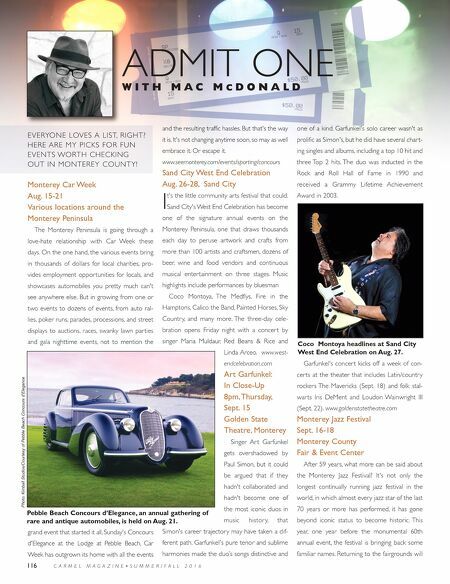 116 C A R M E L M A G A Z I N E • S U M M E R / F A L L 2 0 1 6 Photo: Kimball Studios/Courtesy of Pebble Beach Concours d'Elegance Coco Montoya headlines at Sand City West End Celebration on Aug. 27.